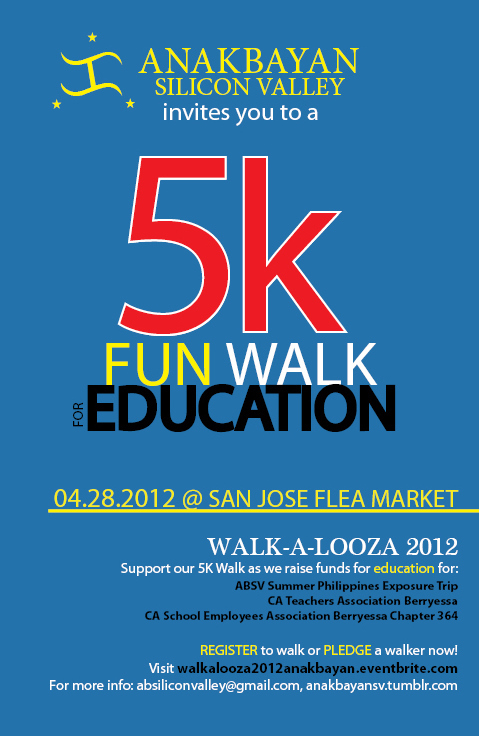 Come and join Anakbayan Silicon Valley as we WALK to raise funds for EDUCATION on April 28, 2012 at the San Jose Berryessa Flea Market. Register to WALK or PLEDGE a walker now! Proceeds from WALK-A-LOOZA will help send our members to integrate with youth and students in the Philippines this summer. After months of study and preparation, these exposure trips, as a form of first-hand EDUCATION, allow youth to experience the conditions in the Philippines and connect and contextualize the local issues here. This is a key, pinnacle experience for generations of youth organizing, to bring about social change both within our community and in the Philippines. Proceeds will also support public education, as funds raised will be used to provide EDUCATORS with necessary classroom instructional supplies. This is essential with the enormous cuts in education. Come out and walk side-by-side with and show support for our local teachers and school employees! Registration Cost: $25 adults, $20 seniors, $15 for 17&under. Registration comes with a free shirt! Walk alongside EDUCATORS and YOUTH while raising funds for EDUCATION and exploring what the large, historic San Jose Flea Market has to offer. A FUN WALK, SHOP, EAT EXTRAVAGANZA. For tracking purposes, please add a note and specify who you are pledging. LUMALAKAS! LUMALAWAK! LUMALAKAD!!! Thank you for your support and we hope to see you at WALK-A-LOOZA!